Your inner history buff will appreciate New Govardhana Australia and Boggo Road Gaol. 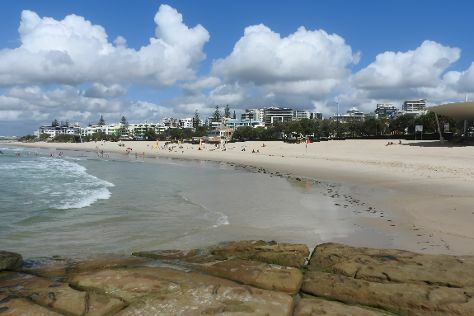 Discover out-of-the-way places like Kirra Beach and Scuba & Snorkeling. Get out of town with these interesting Brisbane side-trips: Caloundra (Kings Beach, Bulcock Beach, & more), Coolangatta (Greenmount Beach, Saint Augustine's Catholic Church, & more) and Surfers Paradise (St Vincent's Catholic Church, SkyPoint Climb, & more). Spend the 22nd (Fri) exploring nature at Natural Bridge. On the 29th (Fri), enjoy an adventurous day among the treetops at some of the top local zipline courses and adventure parks. There's lots more to do: explore the wealth of natural beauty at Burleigh Head National Park, browse the exhibits of Tweed Regional Gallery & Margaret Olley Art Centre, see the interesting displays at Museum of Brisbane, and enjoy the sea views from Fingal Head Lighthouse. To find ratings, reviews, photos, and tourist information, read our Brisbane holiday planner. Manchester, UK to Brisbane is an approximately 26-hour flight. You can also do a combination of flight and bus; or do a combination of flight, bus, and train. The time zone difference when traveling from Manchester to Brisbane is 10 hours. Expect much warmer temperatures when traveling from Manchester in March; daily highs in Brisbane reach 32°C and lows reach 23°C. Finish your sightseeing early on the 3rd (Wed) so you can travel to Melbourne. Your inner history buff will appreciate St. Patrick's Cathedral and Redesdale Bridge. Your itinerary includes some good beach time at Eastern Beach Reserve and McCrae Beach. 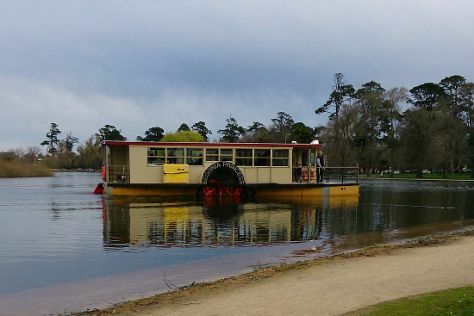 Explore Melbourne's surroundings by going to Creswick (St George's Lake & St Augustine's Church), Ballarat (Lake Wendouree, Ballarat Wildlife Park, & more) and Rod Hadfields Hot Rod Museum (in Chewton). Spend the 25th (Thu) on a tasty journey with a beer tour and tasting. There's still lots to do: take in the spiritual surroundings of St Paul's Cathedral, contemplate the waterfront views at Lake Daylesford, get engrossed in the history at Phillip Island Grand Prix Circuit, and look for all kinds of wild species at Moonlit Sanctuary Wildlife Conservation Park. For where to stay, more things to do, reviews, and other tourist information, read Melbourne online holiday planner . Traveling by flight from Brisbane to Melbourne takes 4.5 hours. Alternatively, you can do a combination of bus and flight; or drive. Traveling from Brisbane in April, things will get little chillier in Melbourne: highs are around 23°C and lows about 11°C. Cap off your sightseeing on the 29th (Mon) early enough to travel back home.